Now I sorta understands why my dad likes to eat this Japanese delicacy. 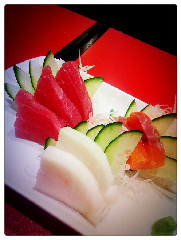 Just had my very first piece of raw salmon fish yesterday, and I've been talking bout how I love Japan and its culture. Lol. You don't love Japan's culture enough if you don't love sashimi. Lol.